"This is a story about five fighters." Uncork'd Entertainment has debuted a bloody new red band trailer for the South African action western film Five Fingers for Marseilles, which first premiered at the Toronto Film Festival last year. The story follows a young boy whose life is changed forever when he kills two corrupt policemen in a South African shanty town. Decades later, he finally heads home but his return brings out his enemies who go after him and all of his friends. The film stars Vuyo Dabula as our hero Tau, along with Hamilton Dhlamini, Zethu Dlomo, Kenneth Nkosi, Mduduzi Mabaso, Aubrey Poolo, Lizwi Vilakazi, Warren Masemola, Anthony Oseyemi, Jerry Mofokeng, plus Kenneth Fok. This "neo-noir" Western has been getting great reviews and looks like it's worth your time to watch if you want to see something gritty and different and entertaining. Get a final glimpse at this here before it hits theaters soon. You can still watch the festival teaser for Five Fingers for Marseilles here, or the full official trailer here. Apartheid South Africa: The community of Railway, attached to the remote town of Marseilles, are the victims of brutal police oppression and only the young "Five Fingers" are willing to stand up to them. Their battle is heartfelt but innocent, until hot-headed Tau kills two policemen in an act of passion. He flees, leaving his brothers and friends behind, but his action has triggered a conflict that will leave both Marseilles and the Five Fingers changed. Twenty years later, Tau is released from prison, now a feared and brutal outlaw, "The Lion of Marseilles." But scarred and empty, he renounces violence and returns home desiring only to reconnect with those he left behind. 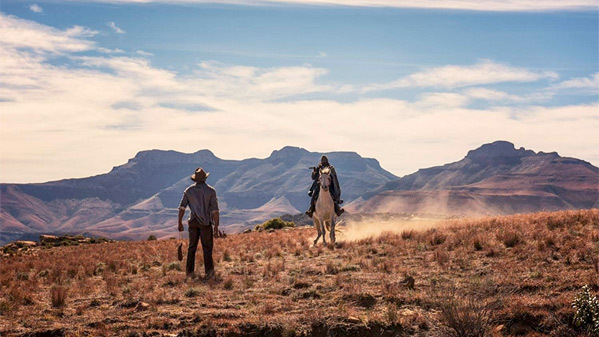 Five Fingers for Marseilles is directed by South African filmmaker Michael Matthews, making his feature directorial debut after a couple of short films previously. The screenplay is written by Sean Drummond. This first premiered at the Toronto Film Festival last year. Uncork'd will finally release Five Fingers for Marseilles in US theaters starting September 7th.